Afghanistan: the child drops the lost tooth down a mouse hole to receive a strong new tooth like a mouse’s. Argentina: children put their tooth in a glass of water for the tooth mouse. Austria: the tooth is made into a key ring, or thrown under the house. Bhutan: the tooth is thrown on the roof as an offering to the moon goddess. Brazil: the tooth is thrown on the roof, so it can turn into gold. Cambodia: the child throws the tooth into the sky so the fairies can bring them a new one. China: upper teeth are placed at the foot of the child’s bed and lower teeth are thrown onto the roof to encourage the permanent teeth to grow faster. Colombia: parents may dip the tooth in silver or gold to be worn as an earring. Egypt: the child wraps the tooth in tissue and throws it to the sun, saying the words “shiny sun, take this buffalo’s tooth and bring me a bride’s tooth, so that Ra, the Sun God, will give them a new one in exchange. El Salvador: the tooth is put under the pillow, and a little rabbit brings the child money. 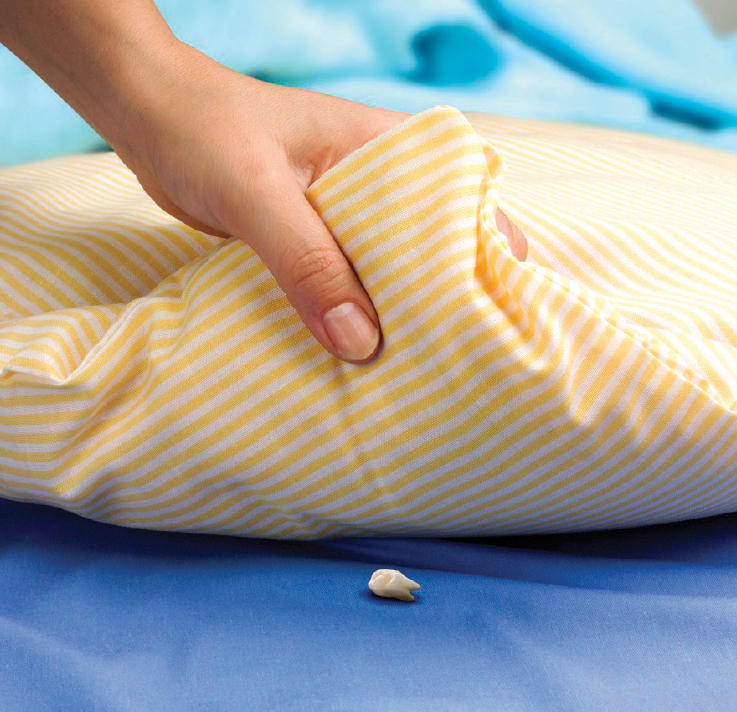 France: in exchange for the tooth, the tooth mouse (La Petite Souris) leaves small toys under the pillow. India: the tooth is thrown onto the roof, and the child asks a sparrow to take it way and bring him a new one. Iraq: the tooth is thrown into the sky, back to Allah. Italy: both the Tooth Fairy and the Tooth Mouse may collect baby teeth in exchange for a present. Japan: bottom teeth are thrown onto the roof, and top teeth are thrown under the house, to encourage them to grow straight, healthy and strong. Lesotho: the tooth is thrown onto the roof of the home, so a lizard can bring the child a new tooth. Mongolia: the tooth is covered in meat fat and fed to a young dog, so the dog can bring a strong new tooth (because dogs have strong teeth and can eat bones). Netherlands: the “tanden fee” will look under the pillow and leave a couple of coins. North Korea: the child throws the tooth in the air, and a black bird comes and takes it away in exchange for a new, white tooth. Nigeria: one of several native traditions is that the child draws 7 circled in a straight line on the ground, and then dances in each circle. Dancing well helps the teeth grow in straight; if you dance badly, they’ll grow crooked. Scotland: in the lowlands, a white fairy rat purchases lost teeth in exchange for coins. South Korea: the child throws the tooth in the air while singing a song, asking the birds to take the old tooth in exchange for a new one. Swaziland: the child puts the tooth in a shoe, and by morning it will be replaced by candy.